If you've been keeping up with tech news over the past 2 years or so it might not be a surprise that HTC has been struggling to keep afloat for a while. Back in August of this year HTC's stocks crashed and some significant changes have already begun at the company to get it back on track. New HTC CEO Cher Wang has been working on getting the company to change up its playbook recently, and that means focusing more on mid-range and entry-level devices that have had a sales boom lately. One of the first big results of these changes has come in the form of the HTC One A9, a mid-range phone in some ways and not so much in others. Does this one fit right in with the more premium One branding HTC has stuck with for quite a few years now, or does it continue to dilute the brand for the masses? Let's check it out. As of this writing the HTC One A9 is selling for $400 on pre-order, a promotional price that's slated to end when the phone launches on November 7th. When that happens the MSRP jumps up to $500, a number that's only $100-200 shy of high-end flagships like the Galaxy S6 Edge Plus and right on par with Google's recently launched Nexus 6p, not to mention higher than phones like the Nexus 5x. With all this in mind keep in mind the HTC One A9 is packing an octa-core 64-bit Snapdragon 617 processor which is actually made up of a quad-core ARM A-53 processor running at 1.52GHz and another one of the same make running at 1.21GHz. The Adreno 405 GPU inside packs some decent horsepower and helps run the 5-inch 1080p Super AMOLED display up front that's covered in Gorilla Glass 4. 3GB of RAM in the US version subverts the 2GB European version, and the US version also includes 32GB of internal storage while the European version only has 16GB. On the bright side with the internal storage there's a microSD card slot for expandable storage. There's a 13-megapixel Sony Exmor IMX214 camera on the back while the front uses a 4-megapixel shooter, both capable of taking up to 1080p video. The 2,150mAh battery is non-removable and the phone is a svelte 145.8mm tall by 70.8mm wide and only 7.3mm thin, while the whole package weighs a pretty average 143 grams. There is a fingerprint sensor under the screen that ties in with Android 6.0 Marshmallow's new official fingerprint support which the phone launches with. Since our review unit didn't come in a retail box we won't cover the contents, as it won't reflect what you would receive when you buy the phone. This certainly seems to be the Autumn of Super AMOLED if big-name phones are anything to go by. The Nexus 6p, OnePlus X and HTC One A9 all have such panels and it's refreshing to see the tech being used in the land of so many LCD powered phones. AMOLED looks considerably better to the eye than an LCD would, and everything from the colors to the black levels are much more pleasing to the eye. As this is an AMOLED it can shut off individual pixels to save battery, a feature that's often used with the Ambient Screen technology Google officially built into Marshmallow. By default the color gamut is pretty saturated, although it's not the most saturated AMOLED I've ever seen, and the whites are a slightly cool hue. There's an sRGB color standard here for those not wanting unrealistic saturated colors, and it not only turns the whites a more warm hue but also significantly dulls the colors, giving them their true representation instead. Refresh rate is phenomenal and viewing angles are mostly good, only showing off a slight rainbow effect at some angles but never messing with the color levels. The digitizer is among the best out there and had no issues with me typing fast, gaming, etc. Brightness on this panel is also phenomenal, and the screen looks absolutely brilliant outside. The 2.5D Gorilla Glass 4 actually makes the display feel a bit raised up from the surface of the phone too, an effect you'll likely notice in the pictures in this review. It's super sharp at 1080p and 5-inches, wish a pixel density of 441 pixels per inch. This is HTC's best display yet, hands down, and it's really a joy to use. Parts of the One A9 absolutely look like an iPhone 6/6s, there's just no way around it. HTC may have founded the aluminum unibody construction years ago with the first One phones, but it seems to have all but given up on its own style with this phone. There's a GIF that went viral not too long ago showing a manufacturing line wiping away the Apple logo, replacing it with an HTC one and scooting the camera over to make an A9, and that's really not far off the mark at all. Even the sides of the phone resemble the iPhone 6/6s, and there's some clear similarities in other areas too. HTC did differentiate on the front with the fingerprint scanner that doubles as a capacitive home button, as well as changing up the speaker grille, microUSB charging port and headset jack on bottom. The right side has the smooth volume rocker at the top, an uncomfortable placement that requires shifting of hands to use, as well as a nicely textured metal power button with deep grooves on it. On the left is the SIM card tray and a microSD card tray, something quite refreshing in the world of phones without expandable storage. The weight of the phone is absolutely perfect and complements the all-metal build, and the thinness of the phone makes it feel really great with a 5-inch screen. Metal makes for a slippery experience though and I found myself nearly dropping it quite a few times since getting the phone, something I'd obviously rather not do if I spent $400-500 on a device. If this happens though you'll be thankful that HTC has their Uh Oh Protection included with the phone, which can be signed up for in the initial setup process. This gives you a full one-time replacement of the phone for any reason at all, even water damage, and provides a value most phones couldn't even dream of. Here's where one of the biggest mysteries of the device will be uncovered. This is the first phone to ship with the new Snapdragon 617 processor, a processor that's a significant upgrade in user experience over the 615 in every way. We've reviewed quite a few phones with the Snapdragon 615 and were generally never impressed with its sluggish performance, even in the UI, but the 617 is a completely different story. In most everyday tasks this feels like flagship performance, only slowing down on web pages with heavy ads or multimedia content, a symptom more of network traffic and loading than processing power. The overall interface is fast, fluid and beautiful as you would expect a modern smartphone to be, and part of this is thanks to the fast internal storage HTC has put in here which is actually faster than the storage found in either of the two new Nexus devices. I have actually never seen a phone fly so fast through a large 600+ song playlist in Google Play Music the way this one does, and a lot of that has to do with the memory speed. Gaming is mostly good with some slow moments depending on the game in question. Most mobile games are pretty simple, but every now and then there's something that pushes the boundaries of what you might think a mobile phone capable of displaying. It's these games that struggle on the A9, and I found even something fairly simple looking like The Walking Dead: No Man's Land struggles because it relies on physics for explosions and ragdoll models whereas the game is smooth as butter on the Nexus 5x. Multi-tasking was mostly great and I found most apps appeared instantly when chosen on the Overview window, a task made even easier thanks to HTC's usage of software buttons and a dedicated Overview button. Oddly though I found that some apps paused in the background, most notably Hangouts and Google Drive. This led to a disjointed experience at times and one that I imagine will only be worse with the European model since it's got 1GB less RAM. The phone fairs pretty well on benchmarks, coming in below the year-old Galaxy Note 4 and the considerably cheaper Asus Zenfone 2 just to name a few at the bottom. Other phones in this price range smoke the A9, there's just no mincing words. The model we received for review works with both AT&T and T-Mobile's network, as well as all the MVNO's associated with each network. What was phenomenal here was that it worked with T-Mobile's WiFi calling service perfectly as well, giving great reception and amazing call quality even when indoors so long as there's an adequate WiFi connection. HD calling is here and works perfectly on both networks, delivering crisp clean sound almost as if the person were standing next to you. On top of this there's of course 4G LTE support and there's even Voice over LTE support if your network allows it. There's a Sprint version launching on November 20th and there should be an official Verizon version coming in December as well. These days of big screens, bright displays, lots of processing power and phones that do nearly everything requires a big battery. Unfortunately, HTC stuck with their usual ways here and packed a relatively tiny 2,150mAh battery inside the One A9. HTC has always done a great job with battery life on the One series relative to the size of the battery inside, and this is certainly no exception. The battery life here is pretty average to say the least, maybe slightly below depending on what you're doing with the phone. No matter what I did I couldn't get more than 3 hours of screen on time, a number that's nearly double that on the cheaper yet more powerful Nexus 5x under certain conditions. Either way battery life wasn't necessarily disappointing but it wasn't great either. The only exception here would be putting the phone into ultra power saving mode, which effectively turns it into a feature phone instead of a smartphone to keep your battery going as long as possible. QuickCharge 3.0 will be coming soon in an update, which is good because with a QC2.0 charger it still took over an hour to charge from 0-100%, something that just feels a little too long for such a small battery. Here's where HTC's bread and butter has been for the past couple of years, and with a small exception that doesn't change here. HTC sent us their Pro Studio headphones to test with the A9, and I can honestly say this is in the absolute top-tier of all smartphones when it comes to sound output quality. The built-in DAC converts 16-bit sound to 24-bit high-resolution audio, and it's obvious from the moment you plug the phone into a sound system. HTC's BoomSound output is incredible and has 3 presets for enhancing audio through earbuds. If you're listening through something else you can always set it to other, which produces a much more neutral sound than the other presets. The only disadvantage here is that while these presets are phenomenal and really enhance sound, there's no manual equalizer to be found, so if one doesn't quite work for you there's not a whole lot you can do about it. The speaker on the device itself is actually quite good and easily eclipses most single bottom-facing speakers on phones out there. It's loud, vibrant, clear and in general just sounds great for this type of speaker. Fans of HTC's BoomSound speakers on the front of the past few One devices will be disappointed though, as the sound here isn't anywhere near that volume or caliber, and while it was certainly enjoyable to listen to music through the speaker here it could have been much better. HTC's Sense skin has come quite a long way over the years, from the ugly and heavy resource hog that it used to be to the light and themable skin that it is now. As a bonus this is the first non-Nexus phone to launch with Android 6.0 Marshmallow and may actually be the first phone in your region to launch with it depending on Google's shipping schedule. This means you're going to be on the bleeding edge of Android features, and combined with HTC's excellent feature-set in Sense you're looking at one of the nicest Android experiences on the market. HTC has also made the bold statement of getting software updates and security patches to users within 15 days of Google updating their Nexus devices, a feat that's just never been done on a non-Nexus handset before. This update schedule combined with the Marshmallow launch package brings quite a bit of hope for the future to any potential HTC One A9 owner and makes us long for the same treatment of other non-Nexus phones by any company. The interface is familiar to anyone who's used either Sense or stock Android before, as it's a perfect blend of both. Font and icons are subtly changed in some areas while others retain that classic HTC look and feel. HTC's home screen launcher is feature packed and looks beautiful, with tons of ways to customize the experience easily. BlinkFeed is here in all its glory and resides on the left-most home screen, waiting to pull in all your favorite feeds and be a one-stop shop for all your social networking and news feed needs. There's a full theme engine built into Sense that can change everything from the software navigations at the bottom to the tinted status bar on the top and everything in-between as well. It's a powerful tool that isn't new with the A9 but is still very welcomed in a land of so many phones that look alike. All of HTC's included apps are well designed and well polished. In this land of hundreds of thousand of alternatives for every little part of Android it's refreshing to still see an OEM trying to make quality software instead of just relying on third parties to do the work for them. There's even an FM radio built right into the device, so no matter where you are or your Internet connection status you can listen to radio with any headset plugged in since the antenna is built into the phone. 100GB of Google Drive storage is included with the phone for 2 years and gives you lots of cloud storage on Google's fast and reliable server farms. The most in-your-face part of the security measures taken on the One A9 is of course the fingerprint scanner which is found just under the screen. It doubles as a home button and provides incredibly quick and accurate fingerprint scanning, right on par with the Note 5 and S6 family of phones as well as both new Nexus devices. As Android 6.0 Marshmallow includes fingerprint scanning support natively your fingerprint is able to be used for more than just unlocking the phone, although right now the only app that really widely supports this is Android Pay. Thankfully there's NFC included here so you can make hassle-free and secure mobile payments with the One A9. Encryption is on by default for all new Android 6.0 Marshmallow powered devices, and this provides some significant enhancements to security for the data you've got stored on your phone. Encryption isn't anything new and was even shipped with last year's Lollipop-powered Nexus 6, but phones with it on by default were few and far between. There's even a decryption screen to start Android, a security measure that keeps thieves out of your stuff and helps keep data-accessing exploits from happening too. App permissions are now part of Android 6.0 Marshmallow and allow users to select which permissions they want applications to access. Upon first launch of any app you'll be asked to approve any number of permissions the app is requesting access to, so you can deny things like access to your contacts, GPS location and more. Sony's IMX214 13-megapixel sensor is found in dozens of devices around the world now. It made its debut in the OnePlus One last summer and blew us away with its quality, but as shown in many phones since then the software is just as important as the sensor. The most notable phones that use this sensor are the Xiaomi Mi4 and Motorola Nexus 6, and the giant chasm of picture quality that can be taken from this sensor is truly something incredible. The One A9 doesn't do anything too bad per say but it doesn't really match expectations for this sensor either. The biggest hangup here was HDR mode, which proved to be so slow it was nearly impossible to use in any situation, especially in darker environments with lots of dark and light spots that need equalizing. Daylight shots are fine and produce quite a bit of detail. Auto mode works well and balances bright light quite well, adapting quickly and taking pictures instantly when the shutter is pressed. Colors are accurate, white balance is good and in general looked pretty good. Low light was where things started to get a little hairy, and while I found some situations the auto mode did a really great job of catching lots of detail and keeping the picture clean, once the light got too dim it became nearly impossible to get a shot at all. Compare this with the incredible performance of the similarly priced Nexus 5x (and also considerably cheaper once the MSRP on the A9 hits) and we were left with nothing but disappointment. This felt a little strange given the polish, design and number of features HTC's camera software has over Google's, but it's clear that Google spent much more time on its image processing algorithms over features, and it paid off in the end. OIS 2.0 is on board the sensor here and is designed to help take better low light shots with less shake, better HDR and smoother less jittery video. However I really found that it doesn't do much if anything at all in any situation I tried it in. There's a video in the gallery below where I'm walking to test the stabilization and it doesn't feel like it's even on at all, or at least it's a very minimal change from not having OIS. Difficulty taking low light and HDR shots also tells me there's something wonky with the OIS as well. The front facing camera is great in good lighting, as it has a wide angle lens to capture plenty of objects in the frame and gives a good quality 4-megapixel shot. It begins to fall apart in lower light though and produces quite a bit of noise in even somewhat low light, leading to pretty disappointing performance overall indoors. Moving onto the software there's plenty here to do. The interface is simple and easy to manage, with a 4-circle button in the bottom to change modes alongside the dedicated shutter, record and thumbnail preview buttons. Up top you'll find context sensitive buttons like switching between front and rear-facing cameras, toggling flash and HDR, and an overflow button for more hidden options. Under modes you'll find selfie, camera, panorama, pro, hyperlapse and slow motion. It's this pro mode that's particularly interesting and takes advantage of the new camera APIs Google has built into Android since last year's release of Lollipop. This includes the ability to shoot in RAW mode as well as toggle shutter speed, ISO, white balance and manual focus on the fly via some handy sliders on the screen. A live preview shows you the result and it makes taking a professional looking shot really easy. RAW editing is here too for those that want to do it on the phone, although thanks to the processor it's an incredibly slow experience. Using the new Snapseed RAW mode might prove a little better, but overall editing RAW photos on a computer is going to be the best experience. 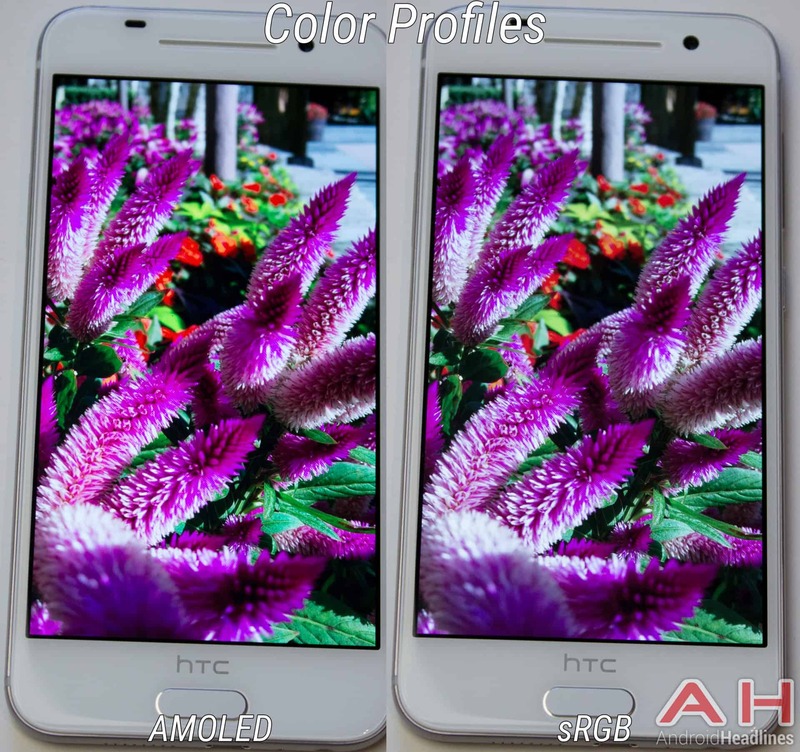 Editing non-RAW photos is as easy as it gets though, and as we saw with the launch of the One M9 earlier this year HTC has spent a lot of time on its picture and video editing tools to make things easy for users. There's some super trendy "hipster" like modes here to create cool looking shapes and collages of pictures, and Zoe makes a return in all its glory to give you simple quick clips of your videos and pictures for sharing with friends and family. Google's Photos app has taken a lot of the uniqueness away from Zoe, but that doesn't mean you can't use both. The HTC One A9 is one incredibly good phone. It feels good in the hand, performs well in most situations and looks great too. There's tons of software features here including the fact that it's running the latest version of Android, Android 6.0 Marshmallow, a first for any non-Nexus phone on the market. HTC is dedicated to keeping the device updated and has provided tons of ways to customize your user experience too, from a highly customizable theme engine with community support built right in, down to the launcher which curates news feeds and suggests apps based on your location. While the camera is great in daylight it's a bit mediocre in lower light situations, a problem that could be slightly rectified with the professional RAW shooting and editing modes that ship with the phone. Sound output is absolutely top-tier among any smartphone on the market and will blow you away with its quality, excluding of course the single bottom-facing speaker on the phone itself. Last but not least is the incredible Super AMOLED display that looks great in any light and is as responsive as they come. Even with all this though it still feels like HTC should have kept the price at $400 or less, but is that really reasonable to say? In this world of Chinese smartphones that often sell for under $200 and provide a good enough experience, is all this extra work that HTC put into the A9 really worth the $200-300 cost difference? Not to mention the fact that this isn't exactly a fast processing package and tends to chug on higher detail games, something that will certainly be a make or break point for some users out there. You'll have to weigh the options for yourself here as there are plenty of positives and only a few negatives, but if you can get this one at a deal it's an absolute no-brainer. This is one phenomenal phone.